The convenient way to transport, store and feed the best nutrition to your baby. They are compatible with many pumps and can also be used as a bottle. VIA pre-sterilised Cups are ready to use straight from the pack. They can be re-sterilised, used again several times then discarded if showing signs of wear and tear. Attach VIA Cups to your ISIS pump to express and store breast milk.VIA Cups are sturdy, stackable, easy to label for storage in fridge or freezer. 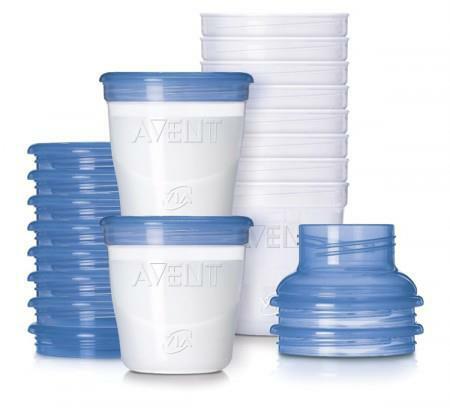 Ideal for breast milk storage, simply replace VIA Lids with your normal AVENT Teats or spouts and adaptor for feeding. Also handy to use when baby starts solids. You can store and transport baby food in these.VIA is a versatile, BPA-Free, space saving storage system designed to grow with your baby. It allows you to use the same cup to express, store and feed breast milk to your baby. No need to transfer your breast milk.